You can pick your friends and you can pick your teeth, but you can’t pick your friends’ teeth… until now, thanks coinci-dentally to 15 cool concept toothpick holders sweet enough to make anyone smile! Designed to display your wee wooden weapons to best advantage, these wholesome (mainly) holders add a dash of designer chic to any kitchen, bar, cafe or chicken wing restaurant. 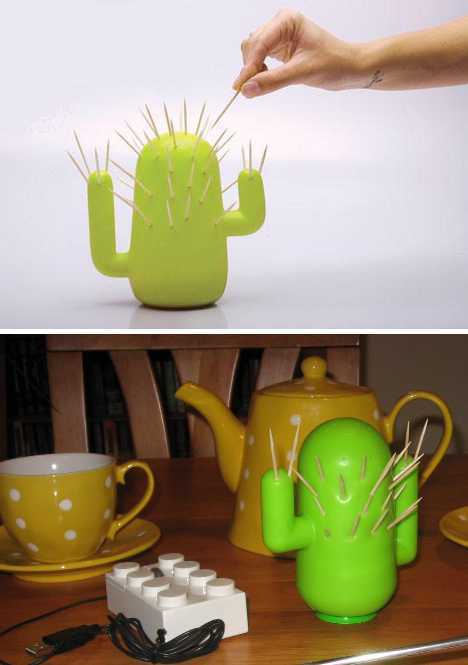 A toothpick holder that looks like a cactus is almost too obvious yet somehow nobody thought of this before – not counting ancient desert tribes who no doubt employed actual cactus spines around the pueblo firepit after roasting, serving and dining on Gila Monster… they can be sorta tough, y’know? The spiny splinter server above goes under the retail name “Cactooph”, which is a might too cutesy for our ears but then, toothpicks shouldn’t be used in one’s ears anyway. 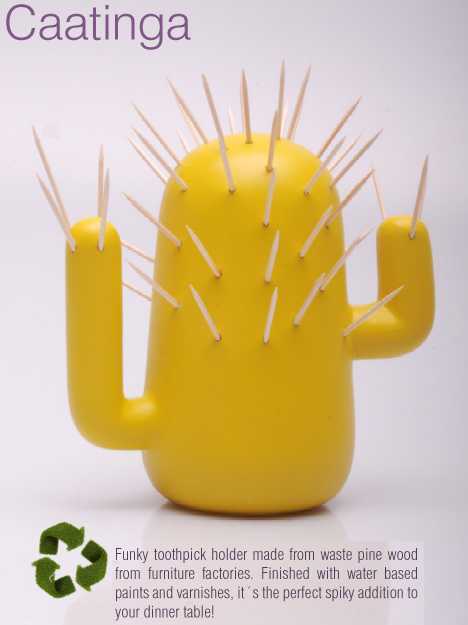 A similar, yellower variation on the Cactooph is the Caatinga Toothpick Holder, conceived by Brazilian designer Naissa Zeh and named after the Caatinga eco-region in Brazil’s arid northeast. It’s manufactured from waste pine scraps sourced from furniture factories and the paints & varnishes are water-based and environmentally friendly – it may be yellow but it’s also green, is what we mean. The Dom-Dom Toothpick Tube from OOU! brings together two things that were made for each other: condoms and sharp pointed objects… wait, what? 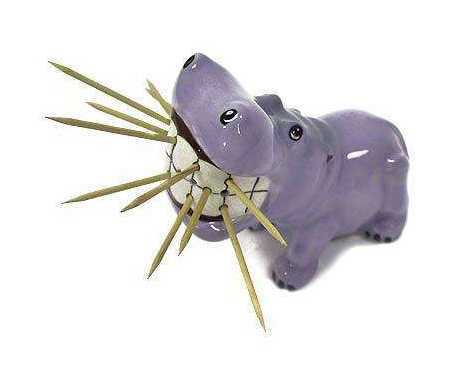 According to the fine print on the product page, this cheeky toothpick holder was made in mainland China, the world’s most populous country. No connection, of course. The Dom-Dom Toothpick Tube is made from non-toxic, food grade plastic, which is nice. It also, again according to the company website, features “Lifelike modelling Inner Tibet unexpected tallies extremely the functionality, does smiles does not forget practical. The color change has increased taste bud’s fantasy.” Sounds good, put us down for a dozen! 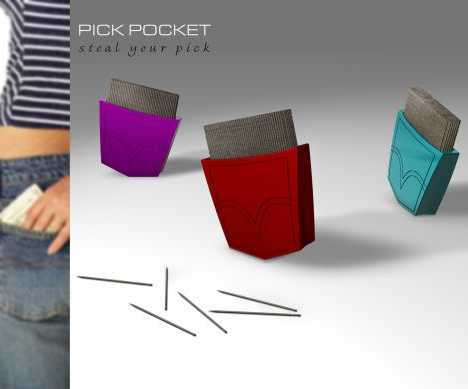 The Pick Pocket Toothpick Holder from Chetan Sorab of Epicenter Design encourages users to pick your pocket to “steal your pick”, though it seems all parties concerned will end up disappointed by that particular action. Even so, the concept has a certain appeal: a pocket for your toothpicks that you can keep in your pocket. Sure beats poking holes in your pants (or possibly worse) every time you pocket a pick. Peter Piper picked a peck of pickled peppers, but when Peter Piper polished off the peppers and probed his pocket to pick up a pick, his pre-poked pockets proved pick-less! Now thanks to the Pick Pocket Toothpick Holder, Peter Piper’s picks in his pockets remain fixed, so picking specks of pickled peppers is a quick & simple trick. Off to do that voodoo that you do so well? 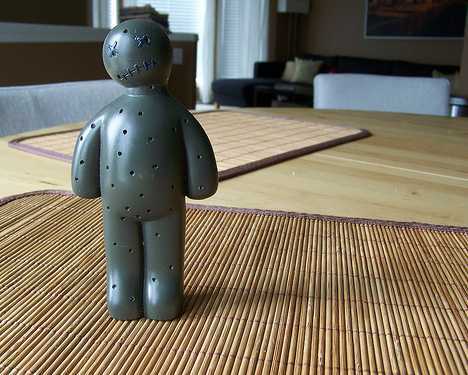 If you’re doing it over lunch or dinner, be sure to bring along your Voodoo Doll Toothpick Holder. Not only will you have something handy to excise that piece of chive clinging so obviously to your right bicuspid, you can enjoy the anxious squirming of your dining partner as you casually toy with the toothpicks and make him or her an offer they can’t refuse. 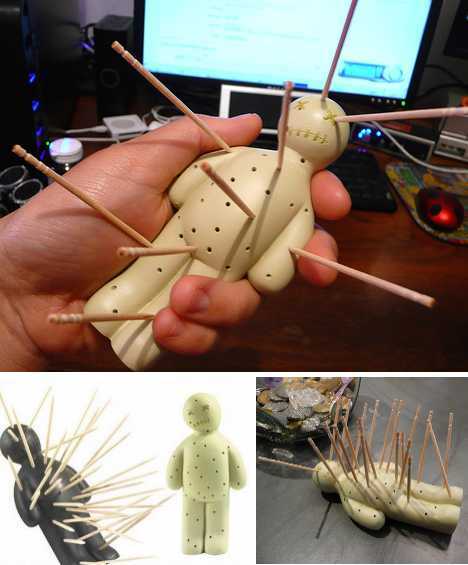 The Voodoo Doll Toothpick Holder comes in your choice of colors, allowing to you freak out those of most any race or creed. Especially Creed, that guy’s just too creepy to share an office with. 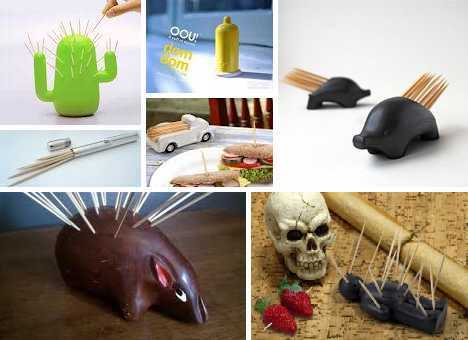 The 4.5” long by 2” wide Toothpickup Toothpick Holder takes the concept of “pickup sticks” to the next level. 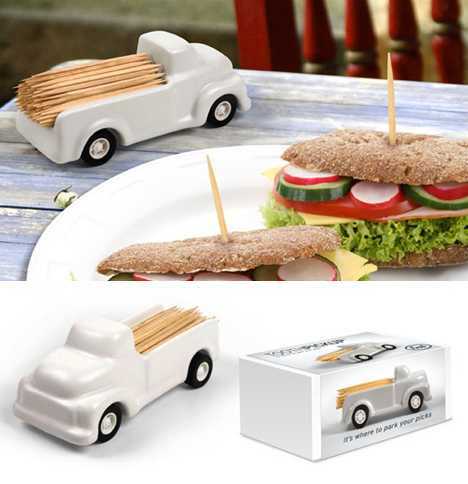 Designed to ape the appearance of a classic early Fifties pickup truck, this white porcelain wonder actually rolls on its 4 rubber tires allowing for special deliveries to all points of the dinner table. Flippin’ toothpicks, how do they work? 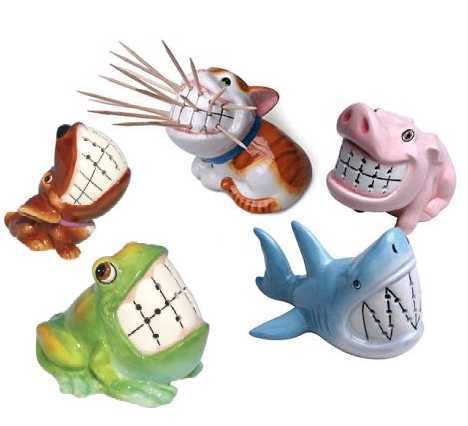 With the Molar Toothpick Holder, one look is all even a junior juggalo needs to put 2 and 2 together. Can’t handle the tooth? 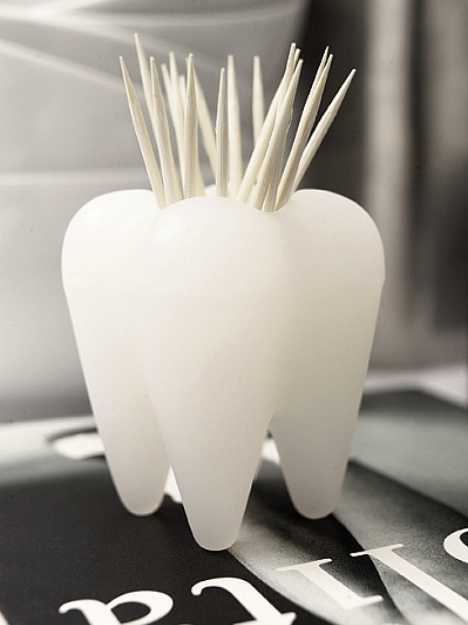 No need to try, the Molar Toothpick Holder has got the chops to handle YOU! 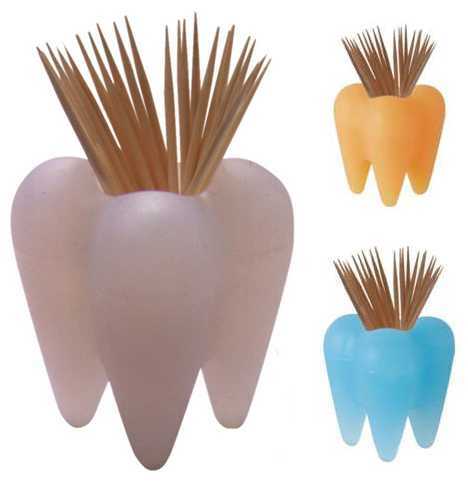 The 4” by 4” by 4” Molar Toothpick Holder is surely a dentists dream. Designed by Chaiyut Plypetch of Panik-Design, the oversized chomper is made from translucent silicon rubber in your choice of white, amber or ice blue (but really, white just seems right). 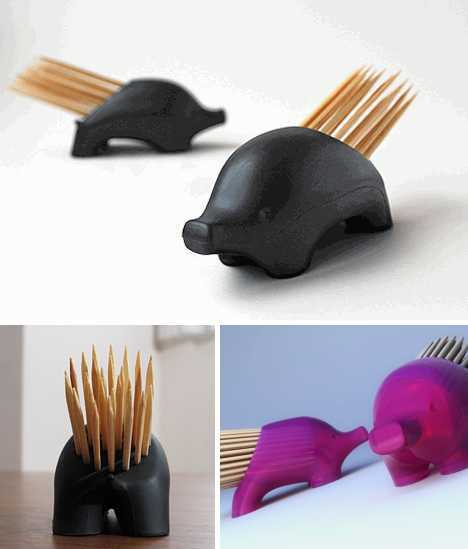 It can hold up to 40 toothpicks in its central cavity. Uh oh, did we say “cavity”? When Rafael Morgan set out to design a stylish and practical toothpick holder, he likely did so with fire in his eye and a steely determination to change the way people looked at toothpick holders. 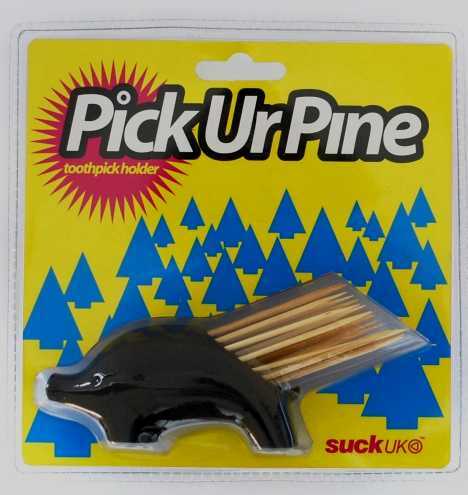 We can definitely state he succeeded on all accounts, which is why dubbing this animalistic toothpick-holding concept the “Pick-Ur-Pine” seems somewhat of a letdown. Not to take anything away from the clean look and undeniable class of this holder, but the name Pick-Ur-Pine, well, just seems to take away from the clean look and undeniable class of this holder. Woody Allen once described a character who, upon reading the word “Lobstermato” (a tomato stuffed with lobster) on a restaurant menu, “wished he could scratch the face of the man who conceived it.” Lord only knows what would have occurred had a Pick-Ur-Pine been on the table. 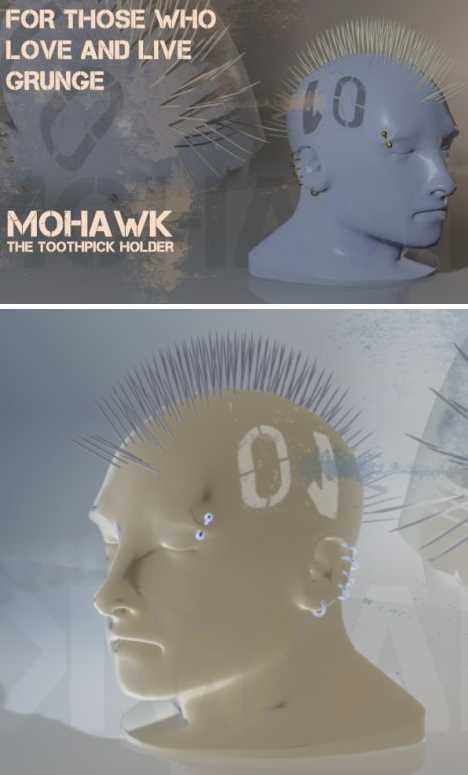 The Mohawk Toothpick Holder comes to us by way of Bangalore, India… not the Indians you were thinking of, hmm? Credit Pankaj Upadhyay with this punked-out design, and be sure to look for it next time you make reservations (ahem) for dinner, maybe at that New Delhi downtown. Looks like our old pal Chetan Sorab is no one trick pony… more like a two trick Great White Shark! 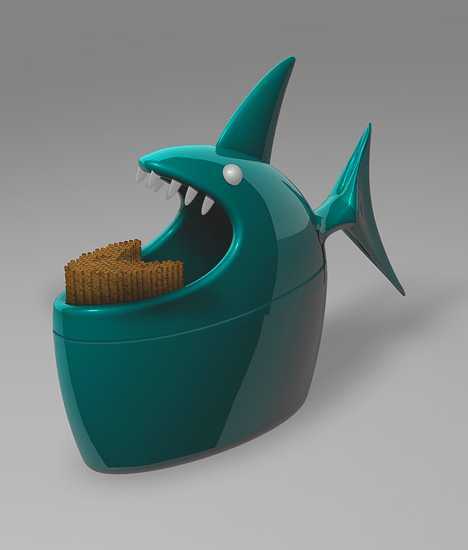 And this latest toothpick holder is a treat indeed: the Shark Tooth Tooth Pick Holder! 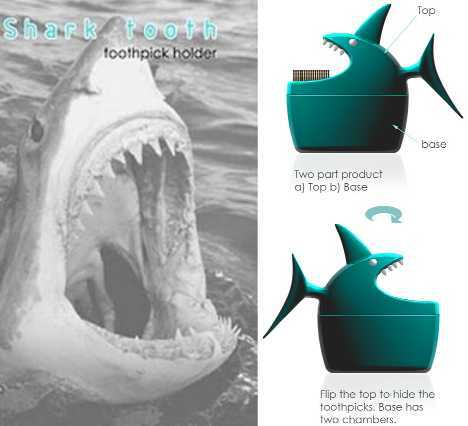 Sorab, who works at Epicenter Design, needed no help from the Department of Redundancy Department when he brought the Shark Tooth Tooth Pick Holder from concept to conference table. That’s his story and he’s sticking to it. The Shark Tooth Tooth Pick Holder doesn’t just sit there like most garden (or ocean) variety toothpick holders. The holder features two-part construction with the top swiveling 180 degrees to cover the toothpicks when they’re not required. Good thinking, Chetan, nobody wants to stick a dusty toothpick in their, er, Jaws. 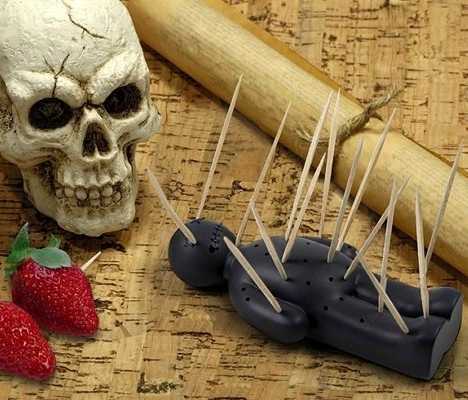 The Hocus Poke Us (groan) Death-Defying Toothpick Holder represents not only the next generation of toothpick holders, it goes one better by improving on the humble toothpick itself. 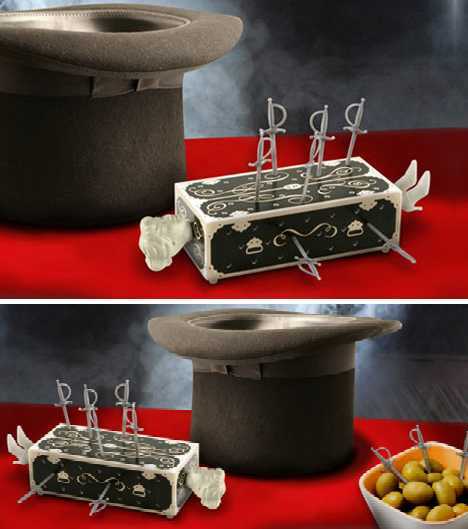 We guess it had to… poking ordinary wooden toothpicks into a miniature replica magician’s body box can’t hold a candle to doing the same thing with tiny little swords! 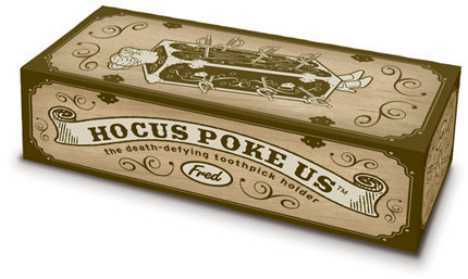 The twists just keep on coming with the Hocus Poke Us Death-Defying Toothpick Holder: the toothpicks are plastic but the holder is wood! The lovely lady immobilized within the box can’t comment, unfortunately, as she’s involved in a high-stakes game of poke her. 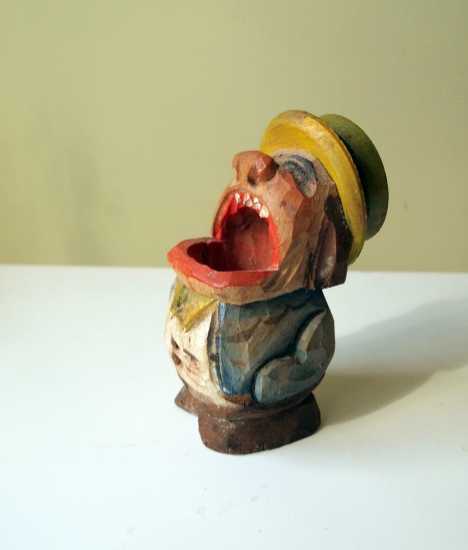 There’s not much we can say about the Screamer Gene Wooden Toothpick Holder because, well, there’s not much to be said, really. 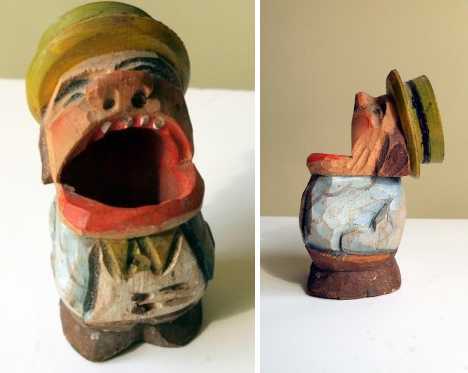 Roughly carved from wood and painted in bright, primary colors, ol’ Screamer Gene is a throwback to rougher, more primal times when men were men and women were wishing the toothpick holders weren’t quite so scary looking. The Etsy seller who displayed the Screamer Gene Wooden Toothpick Holder at their website didn’t show it stuffed with toothpicks, which is kind of odd because it’s assumed that’s the cornerstone of its frontier saloon existence. Then again, doesn’t it look eerie enough without looking like an unfortunate victim of multiple sword-swallowing syndrome? When you need a toothpick really REALLY badly, you’ll do just about anything to get one – including pulling a splendid splinter right out of some non-human critters crazily grinning mouth. Wonder of wonders, you can now do this without any desperation whatsover. You supply the picks, they’ll provide the goofy perforated grin within which you get to stick ’em now, remove for use later. Choose from shark, pig, dachshund, cat, hippo and frog… yes, we know frogs don’t have teeth but if you want to use the real thing, good luck and mind the warts. Snooty is as snooty does, and the Personalized Silver-Plated Toothpick Holder from Harriet Carter is about as snooty (snotty?) as it gets. 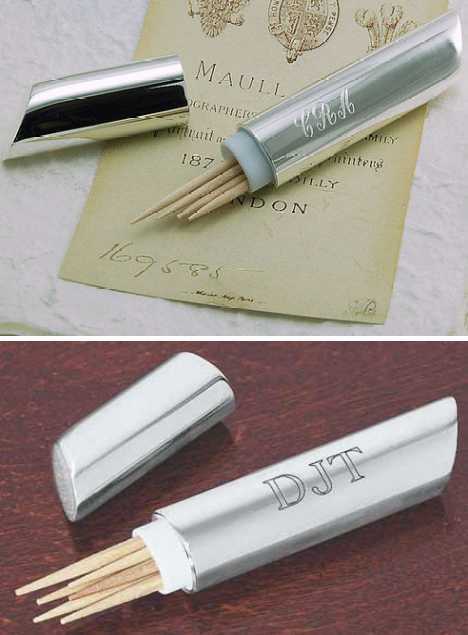 According to the copy at the product page, the “Order of the 3 initials should be: First, Middle, Last.” Geez Louise, er, Harriet, you’d think someone smart enough to reach the stratospheric level of professional achievement needed to own a personalized silver-plated toothpick holder would know the proper order of their initials. This is REALLY gonna confuse Ignace I Ibercrombie the III. 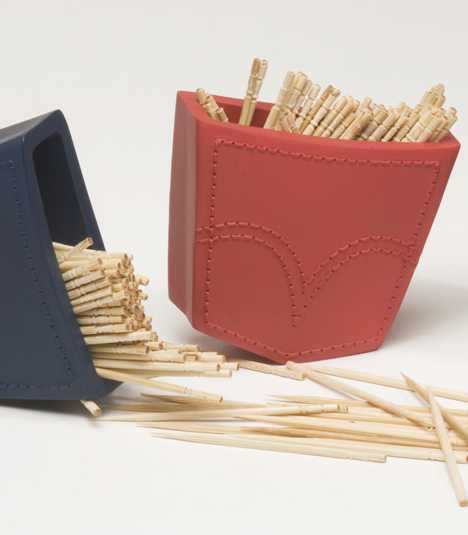 This timeless (OK, it was designed in 1991 by Andrea Branzi) toothpick holder simply exudes class… and also toothpicks. Crafted with care from polished steel and aged varnished pear-wood, this rather large (it’s 6” tall) toothpick holder takes pride of place on any majestic dining table. 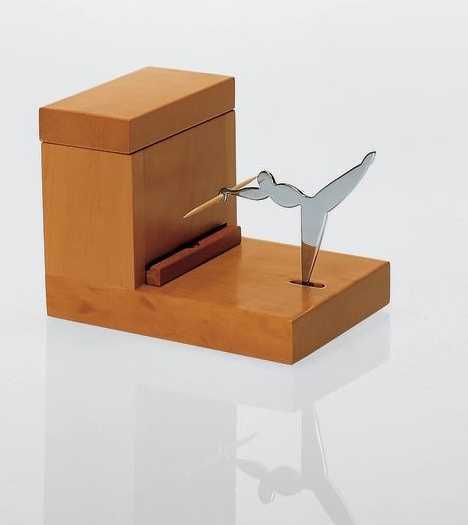 Reminiscent of those old-time coin banks that had cats, dogs, monkeys or whatever grabbing your penny, the Alessi Officina Toothpick Holder features a graceful ballerina who daintily grasps one toothpick at a time, thus keeping the stored toothpicks “hygienically untouched by human hands”. Of course, you still have to grab the toothpick with your own mangy mitts in order to actually use it. Eww. 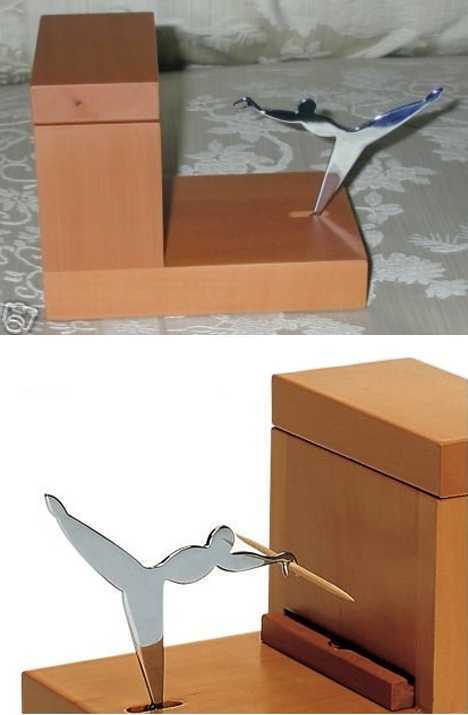 Last but not least, a little toothpick holder history. 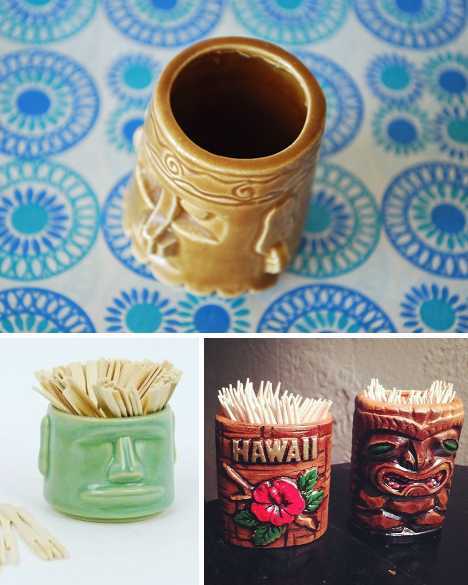 Once a staple of late 1950s Polynesian restaurants and bars, Tiki Toothpick Holders have seemingly scattered to the four winds, ending up on knickknack shelves at flea markets and secondhand stores. The few survivors harken back to a time when “Made In Japan” meant what “Made In China” means today. 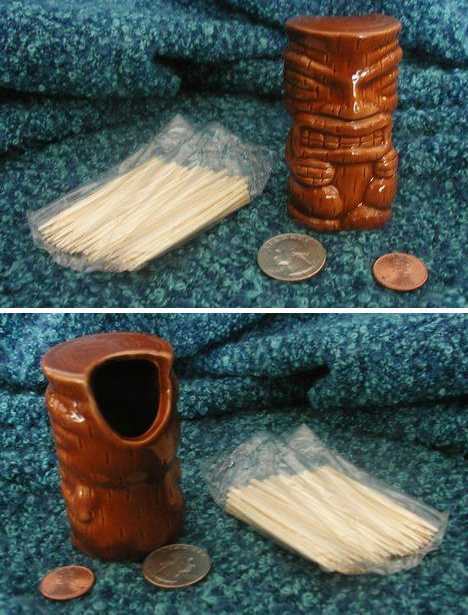 Tiki Toothpick Holders were once sold in supermarkets and came pre-filled with toothpicks. Time passed and the cool sculpted ceramic holders morphed from kooky tiki faces to bland rum barrels to light, thin, plastic holders completely devoid of class and character. Turn one upside down… can you guess what it says? Well, hopefully this rundown gave you plenty of food of thought and a number of design ideas to chew on. Of course, you’ve come to the right place if all that chewing has left you up the proverbial creek without a toothbrush. We know the next best thing!